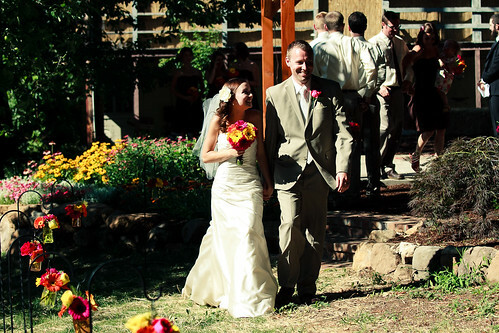 Our wedding colors were fuchsia and chocolate brown. 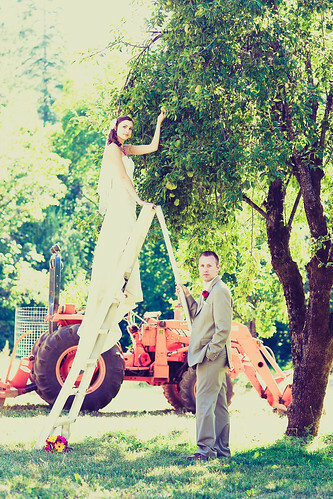 Being that the wedding was held outside in my parents’ orchard, I wanted to keep everything simple and a little bit country. 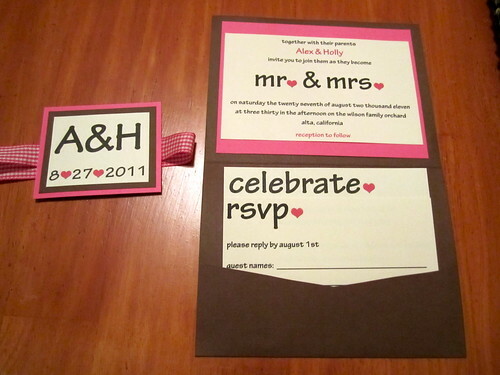 Starting with our invitations, I used a Mr. & Mrs. theme and incorporated in some gingham ribbon. I knew I wanted pocket fold invites and read probably 15 tutorials on making diy pocket fold invitations before getting started on them. Click here for the full story and how they are made. After making the invitations, I used the left over brown and cream paper to make the place cards. I used a fun floral stamp to add in fuchsia and made wine cork card holders to set each card in. 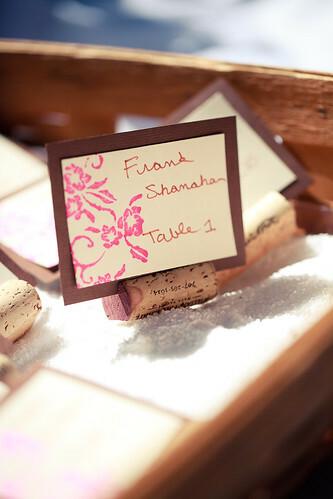 Click here to see more details of how to make wine cork place card holders and stamped guest cards. I wanted a rustic and unique way to give our guests an area to put gifts. 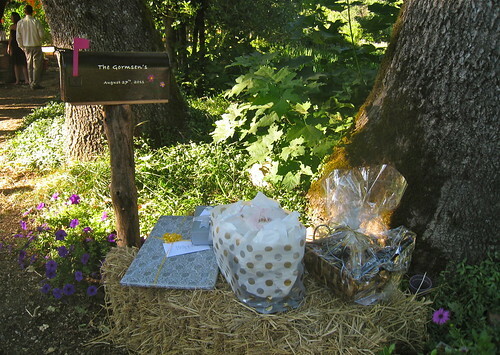 What we ended up doing was using a straw bale next to the tree with our welcome sign for gifts and then I painted a mailbox and attached it to a post to collect any cards. I just loved how it turned out! Click here to learn more about how I made this wedding mailbox. 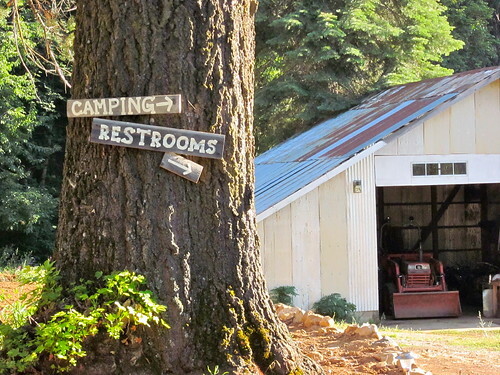 Speaking of rustic wood signage, all over the reception we had hand painted signs directing our guests to the bar, restrooms, campground (we invited everyone to stay the night and camp with us), parking, etc. I might have gone a little overboard with the amount of signs, but I thought they fit in really well with the outdoor orchard theme. 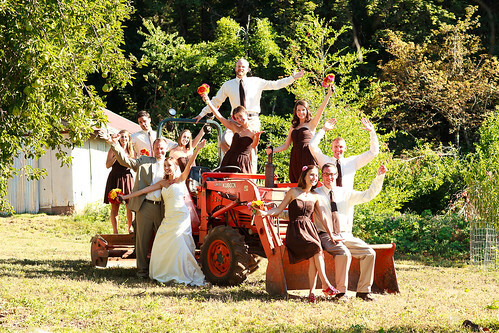 I just love this picture with my dad’s tractor in the background! For table settings we wanted it simple and clean. We opted for cream table cloths and then I purchased brown gingham fabric at fabric.com. If you are looking for fabric, it is a great place to buy from and I love the fabric I have purchased there in the past. Great deals from Fabric.com! Click here My mom was kind enough to sew 100 napkins out of the brown gingham fabric and it really brought the country feel to our wedding table setting. Notice the pear on the table? That is our wedding gift for our guests. I wanted something that fit the theme and did not break the bank, so what better than a pear while sitting in the middle of an orchard surrounded by apple and pear trees? 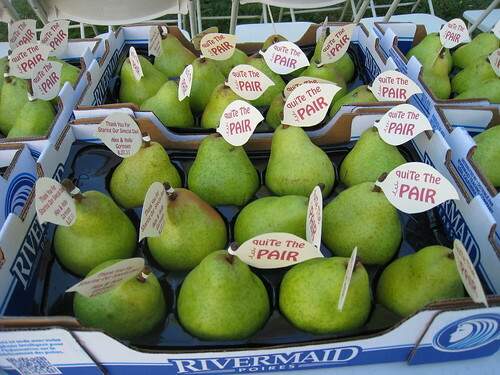 Unfortunately the pears in our orchard were not ready to be picked yet so we had to buy 100 pears at Costco. 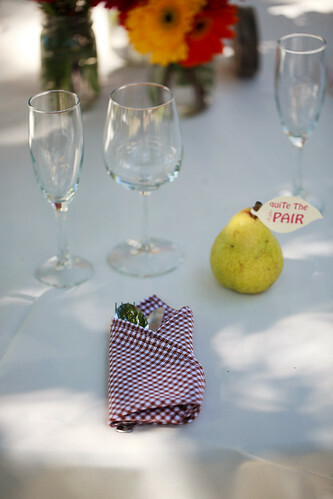 Learn more about our pear guest gift. 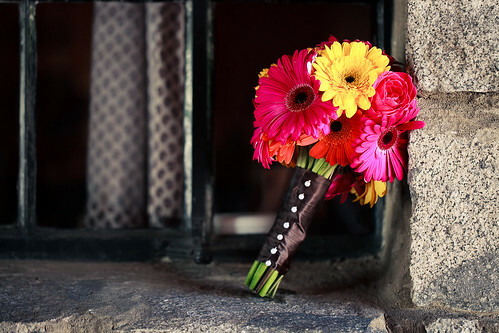 Speaking of flowers…those were DIY too of course. I ordered all of my flowers wholesale through Costco and was able to pick them up at my local store. Awesome experience and the flowers turned out amazing! My sister made the bridal party bouquets, they look so amazingly professional! 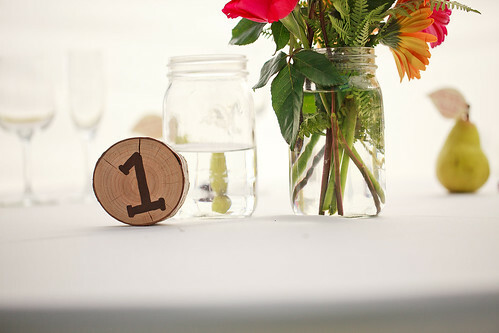 Click here to learn more about our experience in DIY wedding flowers. 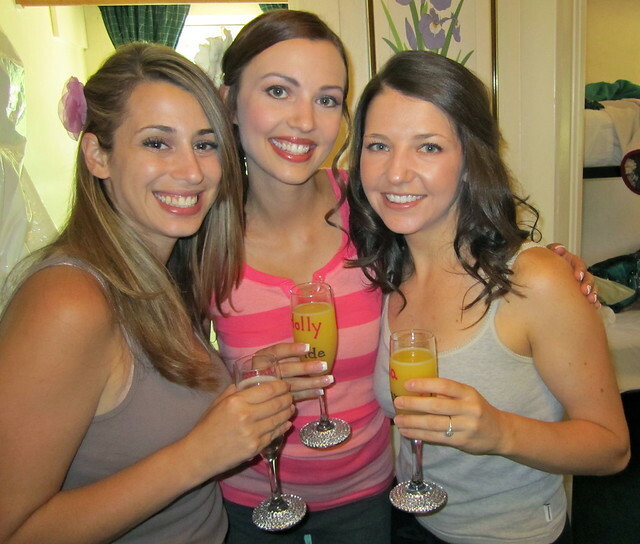 I really wanted to have something to give my bridesmaids that we could use to drink champagne and mimosas as we were getting ready, but also that they could keep afterwards. 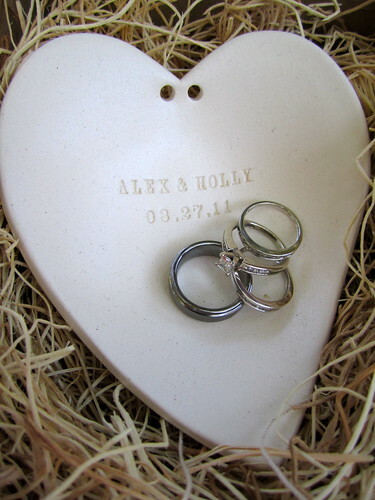 I dressed them up with rhinestones and painted on each persons name and role in the wedding. I also made Alex and I flutes to use for the wedding toast. Like to know how to make these champagne flutes? Here you go! Wedding champagne flute tutorial. This one is not DIY, but I just had to include the awesome ring “pillow” that my sister and brother-in-law (our maid of honor and best man) got for us! How cute right? Now…back to DIY projects, our cake! My mom baked and iced the cake, with the help of our amazing family friend and caterer to decorate with flowers. I made a simple cake topper of our initials in brown with fuchsia to tie in the wedding colors. What is that beautiful cake sitting on? 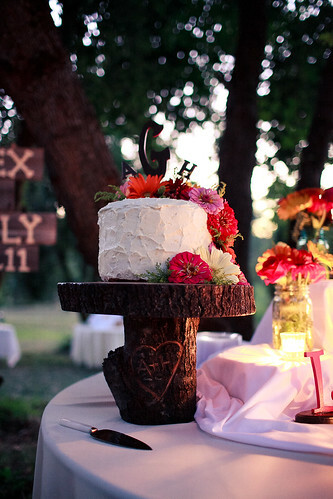 Oh, just the fantastic tree stump cake stand my dad made with A + H carved in it! Now on to one of the larger and more stressful projects we tackled, the shade cloth tent. 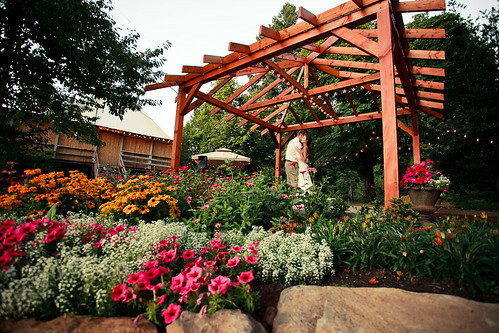 Having a summertime wedding outdoors, we knew heat and direct sun could be a problem. After brain storming and multiple attempts, we were able to come up with a solution of creating this wedding hoop tent to cover the tables. 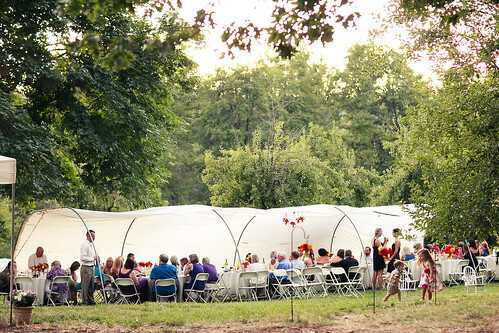 This saved us hundreds of dollars in not having to rent tents and have a great rustic orchard feel. Looking for a drink? 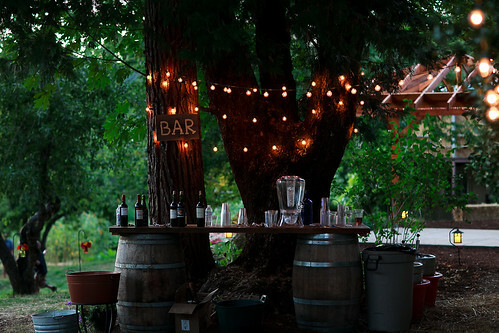 We built this great wine barrel bar for our wedding and plan to use it for every summer party in the orchard moving forward. Super rustic and easy, we used two wine barrels and my dad stained and sealed a large piece of wood to lay on top for the bar. We then painted a Bar sign, hung up the carnival lights, and added our wine selection, kegs and signature cranberry lime spritzer cocktail. 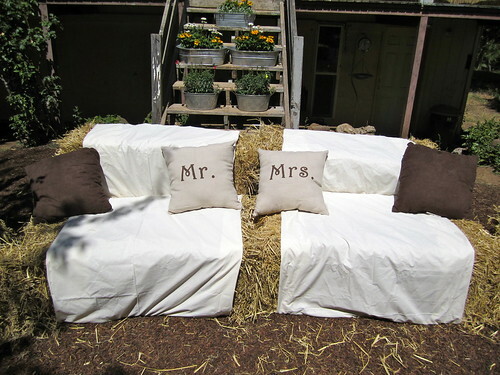 To add a seating area near the dance floor, I really loved the idea of straw bale couches. With the added touch of my handmade Mr. & Mrs. pillows, it was beautiful and functional! Here is the tutorial about our hay couches and making those Mr. & Mrs. pillows without a sewing machine. Speaking of the dance floor, my dad built us this amazing gazebo to double as the setting for the ceremony and the dance floor! Here we are having our first dance..”I wanna love you, and treat you right!” Our first dance song was Bob Marley, Is This Love. Being that one of my favorite pastimes is making jewelry, it was a no brainer that I would make my bridal jewelry as well as my bridesmaids jewelry. To bring in our wedding color of fuchsia I bought these amazing fuchsia pearls and paired them with sterling silver and Swarovski crystals. 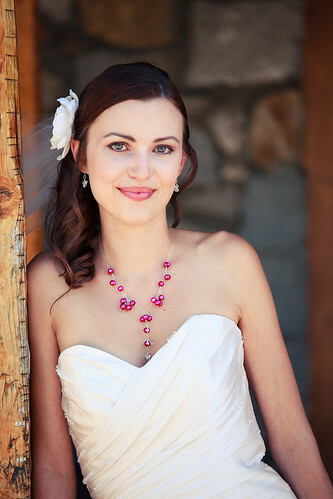 Here is the step-by-step process of how I made my wedding jewelry and my bridesmaid necklaces. …and thank you signs. Loved this idea I had seen while planning our wedding. We took this picture with our “Thank You” signs and used it to make our Thank You cards. Simple and easy Thank You card tutorial. 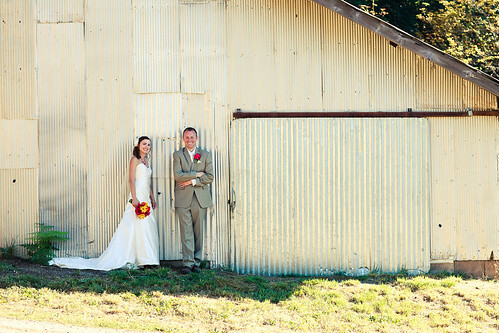 What a whirlwind our wedding was. 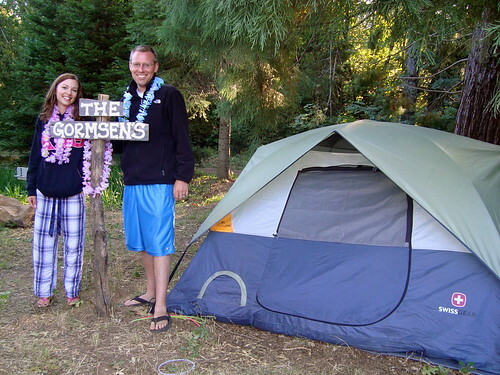 Here we are the next morning after camping in our Honeymoon tent Off to Maui we go! This is AMAZING!! everything turned out so beautiful!